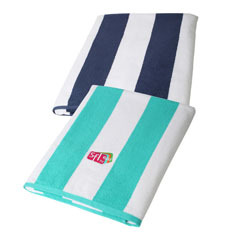 Our Velvety Soft, Mid-weight, Classic Cabana Stripe, Premium Brand Beach Towel comes in the most popular corporate colors and allows a high end look on a conservative budget. 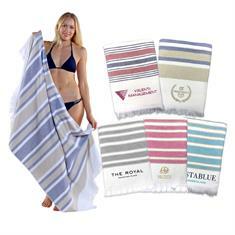 This oversized Brazilian, Premium Brand, beach towel receives high praises on its colossal weight and elegant luster. 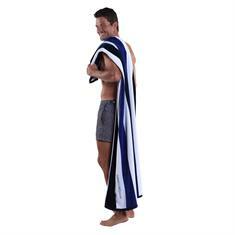 Our Luxurious, Heavyweight Cabana Stripe Beach Towel comes in a unique tri-color stripe of Navy/White/Royal. This one-of-a-kind version of the classic cabana includes an ultra soft velour finish with a fancy dobby hem. 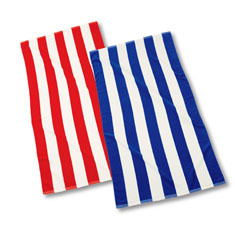 These traditional rubgy stripes are heavyweight, USA Made, velour towels that have the design actually woven into the towel, providing color on both sides. 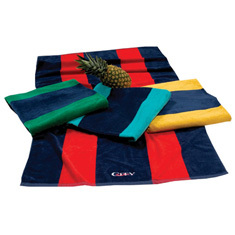 They offer a grand statement in both color and elegance. 40 x 70, 26.5 lb., Superior Heavyweight, Terry Loop. 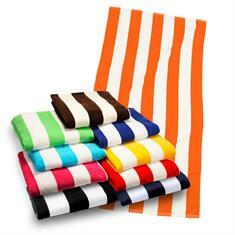 Our New terry loop cabana stripe is sure to please! 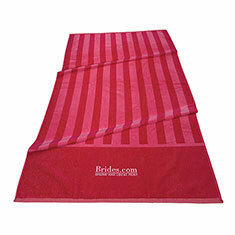 It is statuesque in size, made with thick and absorbent cotton and has a smart dobby hem.